National University 1st Convocation 2016 Online Registration | www.nu.edu.bd. The convocation of National University for the 1st time is going to be held. It will be held in the month of November, 2016. The president of Bangladesh and the chancellor of National University gave positive sign regarding this convocation. Date of NU 1st Convocation: November, 2016. There are a lot of students who are taking higher education in different colleges of Bangladesh under National University. In this regard many of the students will take part in this programme. According to the source of NU around one and half lakh graduated students will participate in National University 1st Convocation. The Interested candidates will have to register through online at http://convocation.nu.edu.bd/. The candidates have to pay Convocation Registration Fees (2500/-) and Certificate Fees (500/-) via Sonali Seba, DBBL mobile banking and Credit/Debit Card (Master Card, Visa, Nexus). The final list of the participants and the venue of the convocation will be published at the official website of National University. We will provide every update of the convocation. Like Our Facebook Fanpage facebook.com/resultnotice to get the latest updates of National University 1st Convocation 2016 and get future updates. This entry was posted in National university and tagged National University 1st Convocation Online Registration, National University 1st Convocation. 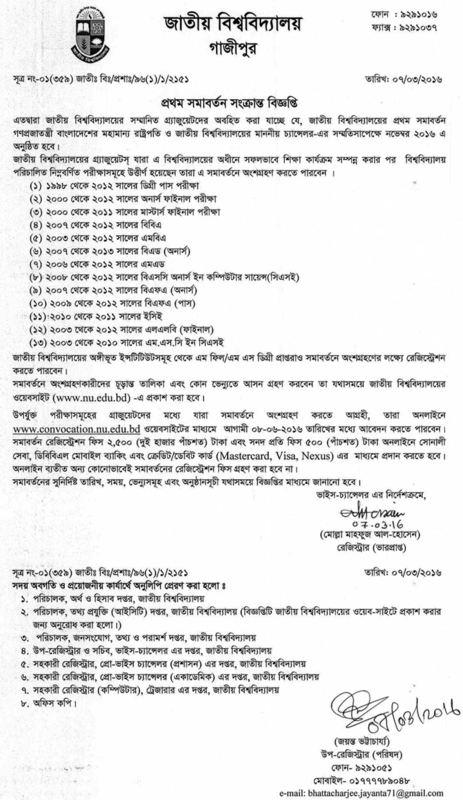 National University Convocation 2016 by Result Gov BD. Bookmark the permalink.